SCCF and the Conservancy of Southwest Florida have launched a new program to track the movements of green sea turtles nesting in Southwest Florida.Our team of biologists attach a transmitter to the female green sea turtle shell after nesting which is then tracked on a satellite-based system called ARGOS (find out all the details on how ARGOS works here). Transmitters are attached to the shell using a marine epoxy and then painted with an anti-fouling paint, just like the paint used on boats, to discourage the growth of barnacles and other epibiota. The transmitter, epoxy, and paint do no harm to the turtle and eventually fall off, or are removed by researchers, where they can be collected and used for further studies. 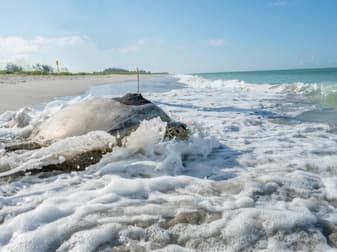 Although satellite tracking of loggerhead sea turtles on Florida's Gulf coast has provided considerable insight into post-nesting movements, this is the first study to explore the migratory pathways and foraging grounds of greens in our region. These data can be used to expound on the life history of the species, while also providing important information to resource managers in the area and helping in the overall recovery of this protected species.